Discover Unparalleled Fine Dining at The Farmhouse. Where foods of rare excellence are served in an elegant provincial setting. Intimate candlelit dining rooms, exceptional service, award-winning menus featuring The Farmhouse famous crab cakes, and many seasonal specials all contribute to a delightful dining experience. Sundays, a superb prix fixe three-course dinner is offered. The intimate Farmhouse bar with fireplace is a local favorite. Reserve the unique subterranean wine cellar featuring the Wine Spectator Award winning wine list for a very special Chef’s Table. Enjoy summer evenings of genteel tableside service on the Farmhouse’s covered outdoor patio. The 18th century Farmhouse is open for dinner Thursday – Sunday. The Farmhouse is the quintessential destination. Indoor and outdoor catering is available for parties, meetings, and corporate events. 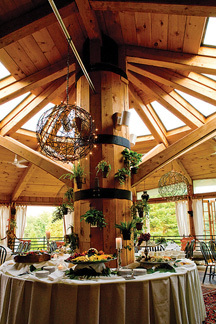 Specializing in weddings, Chef Roland creates your menu from farm-fresh foods. No frozen or pre-made foods are ever used. The gracious Banquet Room connects to a soaring sky lit Round Room offering a beautiful view of gardens and golf course. Sip a frosted mug of beer or special Martini in the adjacent air-conditioned Tavern with flat screen TV or dine out of doors and watch play from the Tavern’s open-air brick patio. 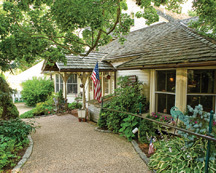 The Greathouse and Tavern are open daily for lunch and dinner. Sunday Brunch is served in Country Elegance while enjoying a complimentary flute of champagne. Free Children’s menu. This is a true shot maker’s course with tree lined fairways winding through wetlands, lakes, and ponds. There’s a fully stocked golf shop, locker facilities, and Men’s & Ladies Associations. Lessons are available for all levels. Be sure to stop by the uniq ue Tavern for food, drink, and conversation. Visit us online at www.lochnairn.com or call 610.268.2235. ← Previous Story Delaware Workers’ Compensation Benefits – Show me the money! Next Story → PrideKlean – During Breast Cancer Awareness Month, We Will Give Away a Year of Free Cleaning!